Treat the wildlife and creatures in your garden to a home. 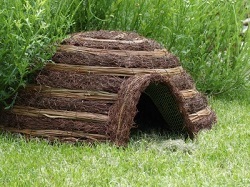 We sell habitats for insects such as bees, butterflies and creepy crawlies, also hedgehog houses such as the Igloo hedgehog house and a great choice of bird nest boxes with cameras. You'll find everything here for the garden insects including products from the British manufacturer Wildlife World such as the popular Conservation solitary bee hotel and the Hogilo hedgehog home and care packs.